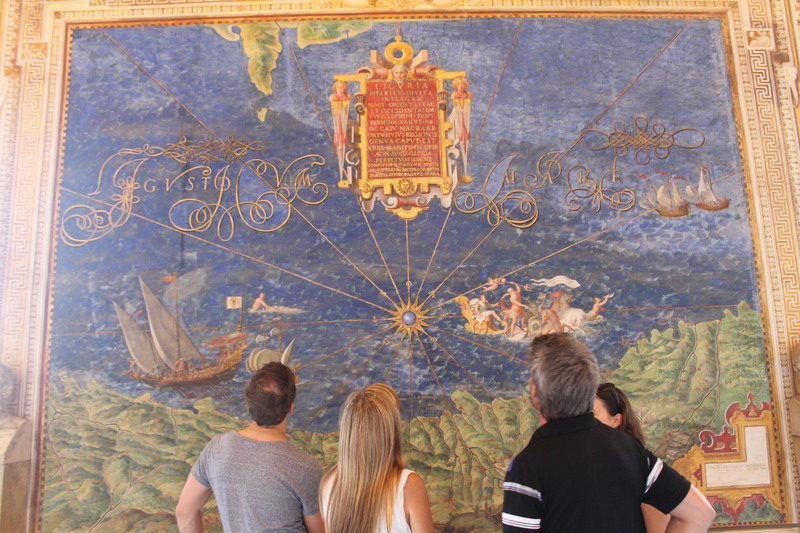 The next day, we pulled into the port town of Civitavecchia about an hour and a half outside of Rome. Our tour guide’s name was Fabio, a short, lean Italian man with a scruffy beard. He was also possibly the most polite person I’ve ever met (he addressed my Mom as “madam” the entire day and refused to take off his sports jacket or loosen his tie in the plus 30 degree heat). Though he spoke with an Italian accent, he only moved to Rome in the 1980’s when his Italian citizenship required him to serve in the military after high school. In fact, he went to a high school not far from where Norm grew up in Scarborough. He was a Canadian kid, but he knew everything we could have hoped to learn about the ancient city. Our first stop was the Trevi fountain, one of many massive stone monuments we would see that day. Originally, I thought the scene was carved into the side of a building but, turns out, the building is the fountain. It marks an endpoint of an aqueduct as did most fountains in ancient Rome. But the Trevi, as it stands today, wasn’t built until the 18th century when the Pope commissioned it in honour the ancient Roman tradition. What was little more than a basin before now depicts a magnificent mythological scene. “The Pope asked for a depiction of nature,” Fabio told us as we stopped just out of sight of it. What we saw was much more than that. The god of all water, Oceanus, stands at the centre surrounded by crashing waves frozen in the rock. Great half-submerged horses of myth rear their heads and beat their wings to herald the arrival of the water while well-muscled servants of the god struggle to restrain them. Up above, angels look down on it all with an expression of gentle content. We spent the rest of the morning in the ancient part of the city. 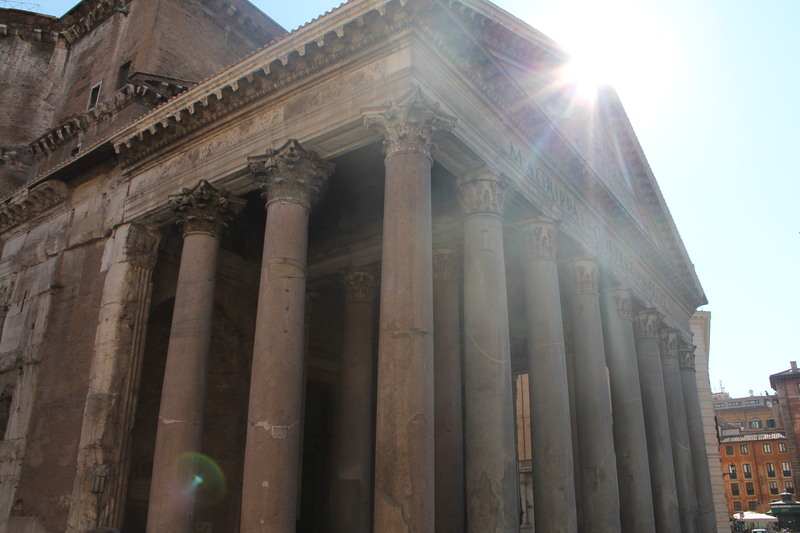 We saw the ruins of the Roman forum and the great arches of the Emperors. We walked up and down the Spanish steps and made a half-hearted effort to decipher all the Latin numerals and names of popes. We pulled over in Venice square for a curt history lesson and a spectacular view of the great marble Victorian – the monument where the tomb of the Unknown Soldier lies. There, we learned that the moustache hairs on Victor Emmano’s statue – the man who united Italy about 150 years ago – are more than four feet long. We saw Mussolini’s balcony and stopped for a picture with Marcus Aurelius. At every important spot, Fabio offered an explanation of why it mattered. It was a pleasant combination of myth and fact, popular belief and truth, what actually happened and the things that corrupted those accounts. We talked about the architecture and the atrocities of the Romans. We learned about beauty, art, persecution and euphemisms (apparently the Vatican is built out of “recycled” Roman ruins). We saw the Circus Maximus which is now little more than a few stones scattered around a field. We walked through blistering heat in the crowded Colosseum. We saw its crumbling underbelly where thousands of Christians awaited an unimaginably degrading death at the paws of great beasts and jeering crowds. We took it all in, forgetting how overwhelming it all was, and we hadn’t even stopped for lunch yet. We spent the afternoon in Vatican City with another tour guide and friend of Fabio’s named Valencia. Whenever we talk about the trip, Mom always insists on calling her “Valerie” saying it is the English translation of the name. It’s not. Despite Valencia’s deliberate attention to detail along every inch of museum and church in the holy city, she didn’t seem to mind that my Mom was mispronouncing her name. As expected, the tiny country was jam packed. On average, about 26,000 people walk through there every day to get just a quick look at the treasures the Church has collected. The Vatican is the smallest independent state in the world by both geography and population but Valencia told us it also controls 4% of the World’s total land mass. Like any country it has a number of economic investments but unlike many countries, it has a great and powerful history. All of these things make the Vatican incredibly wealthy and that becomes very obvious when you go through its museum. Rushing back from my childhood like a sudden burst, I remembered an oft-quoted saying from the New Testament: It is easier for a camel to pass through the eye of a needle than it is for a rich man to enter the kingdom of Heaven. After walking through the halls filled with these treasures, the hypocrisy reached its height near the entrance to St. Peter’s basilica. The Church had created a door beside the main entrance, sealed by concrete and only opened once every 25 years. 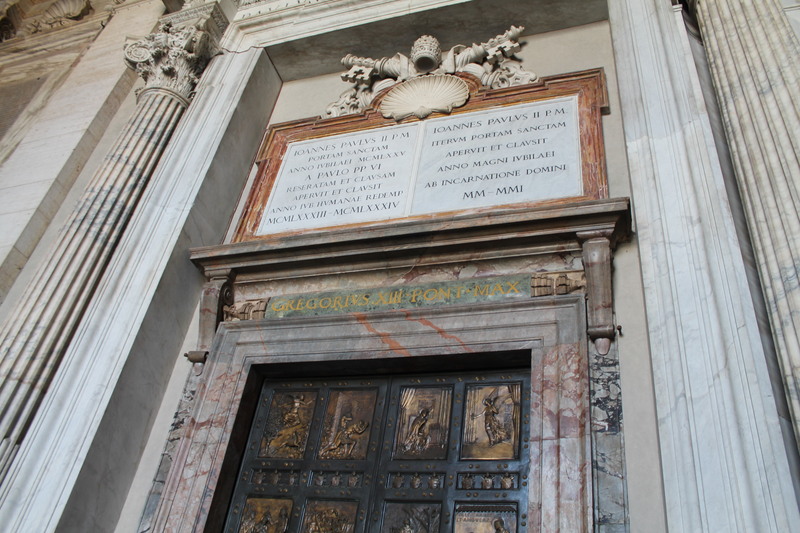 Certain “distinguished” members of our Church and other “worthy donors” would be “blessed” with the opportunity to walk through this door and cleansed of all their sins the next time it opened. In other words, you could pay to have your sins absolved. We were at the eye of the needle. The Church’s wealth had stretched it wide enough for even the fattest-assed camel to waltz on through. Entrance to the Kingdom of Heaven. Still, the treasures there were something to behold. In one hallway, the walls were lined with massive blue tapestries dyed by a powdered mixture of precious stones. In another, a dark red sarcophagus from Egypt towered above the people inspecting the designs carved into its sides. True, these things are a source of the Church’s wealth, but they’ve been acquired over a thousand years and they aren’t going anywhere. All of these artifacts and artworks are priceless. What makes them priceless is not their magnitude but their intricacy. The way the characters on so many ceilings seem to stick out of the fresco; the way an artist can create a mosaic the size of a post-it note from tile pieces so tiny you can’t even tell they’re there from a few feet away. The way that every single foot of wall and ceiling in the biggest church in the world is either engraved, lined with gold, or mosaic’ed. It is simply too much to take in, like flipping through Milton in a single afternoon. Every single piece of art there is testament to a talent that, I am convinced, the world has lost since. This art demanded the artist’s obsession. Michelangelo’s other work in Vatican City is a statue: the Pieta. It is a depiction of the Virgin Mary holding Jesus’ lifeless body in her arms. It sits in St. Peter’s Basilica behind several feet of glass after a crazed Polack took a hammer to it in the 1980’s. When we went, a crowd was gathered around it – a seemingly small one given the scale of everything in the church. To give you an idea, the statue of liberty could be stood up where the altar is and the top of her torch wouldn’t even scrape the painted ceilings. Because it’s so big, we were always getting separated. Whenever one of us stopped to look at something, the rest of the group would be swallowed up by the crowd. Valencia carried a flower on a stick so we could find her when that happened. After stopping to take a picture, I snaked my way through the sea of people to find her standing alone with the flower held high over her head. But she wasn’t looking for us. She was staring up at the ceilings with a look of disbelief on her face. After giving tours of this same place for years, it was no less amazing to her. “There was something very special about the men who made these things,” she said. In the gift shop, I told Valencia about some the difficulties I have with my faith how I’m convinced my over-analytical assessment of religion has made me numb to the feeling of believing. But where I saw complexity, she saw simplicity. “We can be pushed or pulled from the outside but there is something unchanging on the inside, some truth we can feel in our hearts,” she told me. While I can honestly say I felt it when I walked through there, it now remains only in my memory of that place. I saw why Muslims, Jews and Atheists stand in awe just as Catholics do; I saw how the art tells a story that transcends our identities and stretches high towards some truth greater than even the artists could have imagined. But, now I see how easily we lose sight of it once we step outside its churches and museums and we forget how we are dwarfed by the statues that stand there. Fabio picked us up just outside the gift shop. We told him how grateful we were to have someone show us all of these amazing things and how we wouldn’t have been able to appreciate it nearly as much without knowing about it. Fabio quickly pointed out that not everyone thinks about it that way, like the family from Texas he met earlier that month. He was hysterical when he told the story – like an over-caffeinated critic who just snapped trying to explain why Justin Bieber cannot be compared to Bach. It was hilarious seeing him get all worked up about but I guess if the sights didn’t matter to the people seeing them then they weren’t missing anything. That was the other thing that made it funny: the idea that these people flew half-way around the world to see something they didn’t care to see. We were in tears by the time we got back to the boat. Once we passed the absent-minded security guards and climbed more stairs than anyone should ever climb on anything that floats, we were back in our rooms. Aidan turned on a movie and I went up to the sundeck with my book. I opened up one of the middle chapters of Dandelion Wine something I had started reading before we left. It’s a whimsical little story of a small American town in 1929 – a combination of the author’s memory and imagination. The chapter started out with a man who was working to invent a happiness machine, studying all the things that a happiness machine should have: bright colours, sunshine, rainbows, smiles, etc. Then he threw together all those sights, sounds, smells and sensations in hopes of creating something that could create happiness. His wife couldn’t believe it could be done. She thought happiness was too big to cram it into a few bright orange metal tubes so, to prove it to her husband, she got inside. The people from the town came around to witness the spectacle. They listened closely to what was happening inside and after a little while, all the oooo’s and ahhhh’s that lingered just under the the tremor of the cogs faded. Then they heard her crying. The machine had taken her to places she had never dreamed of going. The machine had taken her to Rome. Then, in the blink of an eye, all of it disappeared too quickly for her to understand what had just happened. All of the happiness she felt as she flew to the far-off destination crumbled under the weight of the truth: the Rome she saw wasn’t real. And then all she had was one flimsy memory and the knowledge that she will never see the real Rome. Soon, our ship was pulling out of the harbour and I realized that Rome was gone for me too. It wasn’t a sad thought though; I knew that much after I closed the warm black cover of the book. The Rome I saw that day was real but the day before it was just like it was for the woman in the machine: a place that existed only in my imagination.